This site describes the use and construction of the TR server, an Internet-aware system for creating indeterminate experimental new music. TR takes your composed .ogg files and orders them in a sequence that is driven by data taken from the Internet in real-time. Parameters such as temperatures, wind velocity, humidity and traffic reports are currently enabled and can be used to sequence your music. Your .ogg files are re-sequenced with new Internet data every few hours to create a new version of your piece automatically. On-line listeners are presented with a music player embedded in the TR web page on their browser. TR creates pieces that are similar in construction to In C by Terry Riley. Instead of 53 cells played for a few minutes in groups of two or three by several musicians, TR accepts up to 24 two or three minute segments created from up to three different notated parts. These segments are ordered by real-time Internet data and then mixed into a final .ogg file that is available to listeners through their browser from the TR server web page. TR has been used successfully with rhythmic and ambient music and is adaptable to many styles and techniques. The software described here for creating, editing and transferring music files – Cakewalk, Audacity, sox, CORE FTP, etc are for a PC, but there are likely equivalents for Apple. The TR player is completely open source with all code and files available to those interested in building TR system. 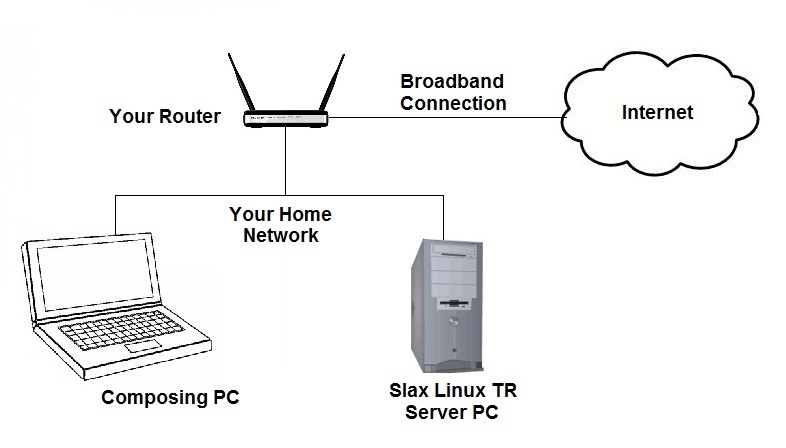 Instructions for creating a Slax-based TR server that boots from a thumb drive are also included – an old Windows PC is perfect for re-purposing into a TR Slax server. See the Obtaining TR link for details. TR web pages are made available via the Internet through your broadband connection – ready for users to access from anywhere in the world.